William Robertson, the son of Thomas Charles Robertson and his wife, Ann Dexter Beet, was born on 29th January 1860 at Welbourn, Lincolnshire. His father was village postmaster and it was a difficult struggle bringing up seven children. Robertson left school at thirteen and worked as a domestic servant for Adeline, Countess of Cardigan, the wife of James Brudenell, the 7th Earl of Cardigan, at Deene Park, Northamptonshire. In November 1877 he enlisted in the British Army at Aldershot. His mother was furious when she heard and wrote to him claiming that "I would rather bury you than see you in a red coat". His biographer, David R. Woodward, has pointed out: "Robertson's choice of an army career seemed an especially unfortunate one for someone without the advantages of birth, wealth, or education. The Victorian army was dominated by middle- and upper-class officers, and a ranker had little opportunity for self-improvement and advancement. But Robertson was not typical of his fellow troopers who devoted their free time to women and excessive drinking. Strong and athletic, he dominated troop competitions. But it was his intellect rather than his physical fitness that largely explains his extraordinary rise through the ranks." At Aldershot, Robertson's progress was steady but not remarkable: lance-corporal (February 1879); corporal (April 1879); lance-sergeant (May 1881); sergeant (January 1882); and troop sergeant-major (March 1885). In 1888 he became second lieutenant in the 3rd Dragoon Guards. Robertson was always uncomfortable about taking his meals in the officers' mess and he told his mother that he did not want them to know about "my previous life". Robertson was sent to India and was attached to the intelligence branch at army headquarters at Shimla. Especially good at languages, he qualified in six Indian ones: Urdu, Hindi, Persian, Pashto, Punjabi, and Gurkhali. He also mastered German and French. In 1895 he was assigned to the intelligence staff of the Chitral Expedition. He was mentioned in dispatches and made DSO after he was attacked and wounded by native guides who were accompanying him on intelligence work. While in India he married Mildred Adelaide, the second daughter of Lieutenant-General Charles Thomas Palin of the Indian Army. Over the next few years they had four children, Brian, Hugh, Rosamund and Helen. Robertson, unlike other officers, drank water instead of alcohol and did not smoke. In December 1896 Captain Robertson returned to England. Having passed the entrance exam for the Camberley Staff College, he joined Britain's emerging military élite. Robertson was the first person to have enlisted as a private to be accepted by Camberley. Other junior officers at the college at this time included Douglas Haig, Edmund Allenby, Archibald Murray and George Milne. David R. Woodward has argued: "Robertson's intellectual mentor, the military theorist George F. R. Henderson, emphasized the concentration of forces in the primary theatre of the enemy in order to overwhelm his main force in a decisive battle. These principles served as a bond between Robertson and Haig when the two men dominated British military policy." In 1900 Robertson joined the intelligence branch of the War Office, joined the intelligence branch of the headquarters staff of Lord Frederick Roberts in South Africa. After only nine months he returned to the War Office as head of the foreign military intelligence section. Over the next six years he followed a policy where Germany was considered the greatest strategic threat to Britain and promoted the idea of an alliance with France was essential to the security of the empire. 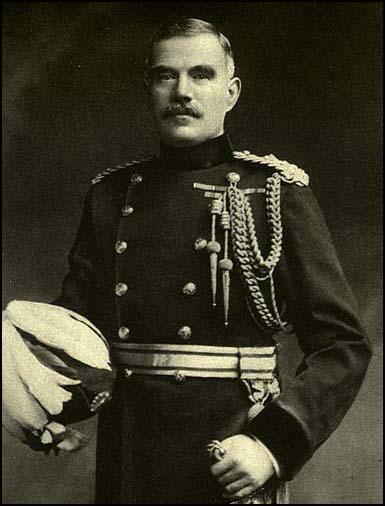 In December 1907 he replaced Archibald Murray as chief of general staff to General Horace Smith-Dorrien at Aldershot. In June 1910 he was appointed as commandant of the Camberley Staff College, and in December he was promoted to the rank of major-general. According to his biographer: "Taking a common-sense approach to the art of war, Robertson trained officers at Camberley to conduct retreats as well as advances. Application took precedence over theory." During this period he became very close to Frederick Maurice, a staff instructor at Camberley. Robertson became director of military training in the War Office in October, 1913. He was disappointed by this appointment because he had a strong desire to command troops. As a result, the chief of the Imperial General Staff (CIGS) promised him his own command in 1914. However, the outbreak of the First World War changed this arrangement as it was felt that at 55 he was too old to lead troops in fighting situations. Instead, he was appointed quartermaster-general of the British Expeditionary Force (BEF) and organised their supply during its thirteen-day retreat from Mons to the Marne. On 25th January, 1915 General Robertson became chief of staff to General John French, commander of the BEF. Soon afterwards Robertson selected Frederick Maurice to take charge of the operations section at general headquarters. According to Maurice's biographer, Trevor Wilson: "They worked well together and Maurice was further promoted. Then in December Robertson was transferred to London to become chief of the Imperial General Staff and principal military adviser to the government. Maurice went with him, to become director of military operations at the War Office with the rank of major-general. At the War Office, Robertson and Maurice worked in agreement. They endorsed a strategy of concentrating Britain's military resources and operations on the western front against the armed might of Germany, and they resisted policies which would have directed Britain's endeavours towards lesser adversaries in more extraneous theatres." Robertson became convinced that the war would be won on the Western Front. Robertson wrote on 8th February, 1915: "If the Germans are to be defeated they must be beaten by a process of slow attrition, by a slow and gradual advance on our part, each step being prepared by a predominant artillery fire and great expenditure of ammunition". His long-term friend, General Douglas Haig, the Commander-in-Chief of the British Expeditionary Force, agreed with this strategy. He wrote in his autobiography, From Private to Field-Marshall (1926): "There was never, so far as I know, any material difference of opinion between us in regard to the main principles to be observed in order to win the war." The military historian, Llewellyn Woodward, has argued that Haig and Robertson should never have followed this policy: "His (Haig) knowledge of his profession was sound and solid; he was a man of strong nerve, resolute, patient, somewhat cold and reserved in temper, unlikely to be thrown off his balance either by calamity or success. He reached opinions slowly, and held to them. He made up his mind in 1915 that the war could be won on the Western Front, and only on the Western Front. He acted on this view, and, at the last, he was right, though it is open to argument not only that victory could have been won sooner elsewhere but that Haig's method of winning it was clumsy, tragically expensive of life, and based for too long on a misreading of the facts." Woodward has also questioned the morality of the policy of attrition. He described it as the "killing Germans until the German army was worn down and exhausted". Woodward argued that it "was not only wasteful and, intellectually, a confession of impotence; it was also extremely dangerous. The Germans might counter Haig's plan by allowing him to wear down his own army in a series of unsuccessful attacks against a skilful defence." David R. Woodward has argued: "Assisted by his handpicked director of military operations, Sir Frederick B. Maurice, Robertson in his new role as chief of general staff attempted to solve the riddle of static trench warfare which had replaced the war of movement of the first months of the war. The ever-expanding system of earthworks had the property of an elastic band. They bent rather than broke. Robertson concluded that a decisive battle was unlikely so long as Germany had reserves to bring forward. To prevent the Germans from gradually giving ground while inflicting heavy losses on the attacker, Robertson and Maurice hoped to nail the defenders to their trenches by choosing an objective which the enemy considered strategically vital." Distressed by the heavy casualties on the Western Front, some politicians began to question Robertson's military strategy. This resulted in the unwillingness of the government to introduce conscription in 1915 and increasing the number of soldiers serving in France. David Lloyd George and Winston Churchill, sought theatres where both political and military gains might be made without engaging the main body of the German Army. However, their views were undermined by failed Gallipoli and Dardanelles ventures. Herbert Henry Asquith, the prime minister, lost faith in Lord Kitchener, and instead began to trust Robertson. His position as the sole military adviser to the government was subsequently given constitutional authority in January 1916 by an order of council issued by George V. Robertson was now based in the War Office. Other changes included Douglas Haig replacing John French as commander-in-chief. Robertson eventually got approval for a major offensive on the Western Front in the summer of 1916. The Battle of the Somme was planned as a joint French and British operation. The idea originally came from the French Commander-in-Chief, Joseph Joffre and was accepted by General Douglas Haig, the British Expeditionary Force (BEF) commander, despite his preference for a large attack in Flanders. Although Joffre was concerned with territorial gain, it was also an attempt to destroy German manpower. General Douglas Haig used 750,000 men (27 divisions) against the German front-line (16 divisions). However, the bombardment failed to destroy either the barbed-wire or the concrete bunkers protecting the German soldiers. This meant that the Germans were able to exploit their good defensive positions on higher ground when the British and French troops attacked at 7.30 on the morning of the 1st July. The BEF suffered 58,000 casualties (a third of them killed), therefore making it the worse day in the history of the British Army. With the winter weather deteriorating General Douglas Haig now brought an end to the Somme Offensive. Since the 1st July, the British has suffered 420,000 casualties. The French lost nearly 200,000 and it is estimated that German casualties were in the region of 500,000. Allied forces gained some land but it reached only 12km at its deepest points. Haig wrote at the time: "The results of the Somme fully justify confidence in our ability to master the enemy's power of resistance." The consequences of the Battle of the Somme put further pressure on the government. Colin Matthew has commented: "The huge casualties of the Somme implied a further drain on manpower and further problems for an economy now struggling to meet the demands made of it... Shipping losses from the U-boats had begun to be significant... Early in November 1916 he (Asquith) called for all departments to write memoranda on how they saw the pattern of 1917, the prologue to a general reconsideration of the allies' position." It has been suggested that Herbert Asquith and the Committee of Imperial Defence (CID) was never able to get total control of the war effort. It has been argued by John F. Naylor: "Neither this flawed body - partly advisory, partly executive - nor its two successors, the Dardanelles committee (June - October 1915), and the war committee (November 1915 - November 1916) enabled the Asquith coalition to prevail over the military authorities in planning what remained an ineffective war effort." Robertson, like most senior members of the military he believed Asquith was incapable of providing the dynamic and purposeful leadership required to see the war through to victory. He gave an interview to the journalist, Robert Donald, who reported: "He (Robertson) liked Mr. Asquith, but he was indecisive. Sir William said that the only man who could decide quickly, say Yes or No without hesitation, was Lloyd George. He might say the wrong Yes or the wrong No sometimes, but he much preferred that to no decision at all. He was in favour of some arrangement which gave Mr. Lloyd George greater power. He did not mean greater power to interfere with military operations, but greater power in the direction of war policy." At a meeting in Paris on 4th November, 1916, David Lloyd George came to the conclusion that the present structure of command and direction of policy could not win the war and might well lose it. Lloyd George agreed with Maurice Hankey, secretary of the Imperial War Cabinet, that he should talk to Andrew Bonar Law, the leader of the Conservative Party, about the situation. Bonar Law remained loyal to Asquith and so Lloyd George contacted Max Aitken instead and told him about his suggested reforms. On 7th December George V asked Lloyd George to form a second coalition government. Max Aitken later recalled that it was the most important thing that he had done in politics: "The destruction of the Asquith Government which was brought about by an honest intrigue. If the Asquith government had gone on, the country would have gone down." Lloyd George was now in overall charge of the war effort. However, Lloyd George found it difficult to control the tactics used by his generals on the Western Front but he had more success with the navy when he persuaded them to use the convoy system to ensure adequate imports of food and military supplies. At various stages advocated a campaign on the Italian front and sought to divert military resources to the Turkish theatre. The failure to breakthrough the German front-lines at Passchendaele, undermined the power of Robertson. At a meeting of the Committee of Imperial Defence (CID) on 30th January, 1918, General Henry Wilson, representing the views of the prime minister, proposed a major spring campaign in Palestine. Robertson, convinced that Germany would try to win the war on the Western Front before the United States became a factor, angered David Lloyd George when he spoke in the presence of other allied political leaders against gambling scarce military resources in the outside theatres. Lloyd George wrote that a "formidable conspiracy was under way. Robertson and his friends meant this time to fight to the finish." According to the historian, Michael Kettle, Robertson became involved in a plot to overthrow David Lloyd George. Others involved in the conspiracy included Maurice Hankey, the secretary of the Committee of Imperial Defence (CID), General Frederick Maurice, director of military operations at the War Office and Colonel Charles Repington, the military correspondent of the Morning Post. Kettle argues that: "What Maurice had in mind was a small War Cabinet, dominated by Robertson, assisted by a brilliant British Ludendorff, and with a subservient Prime Minister. It is unclear who Maurice had in mind for this Ludendorff figure; but it is very clear that the intention was to get rid of Lloyd George - and quickly." Robertson disagreed with Lloyd George's proposal to create an executive war board, chaired by Ferdinand Foch, with broad powers over allied reserves. Robertson expressed his opposition to General Herbert Plumer in a letter on 4th February, 1918: "It is impossible to have Chiefs of the General Staffs dealing with operations in all respects except reserves and to have people with no other responsibilities dealing with reserves and nothing else. In fact the decision is unsound, and neither do I see how it is to be worked either legally or constitutionally." On 11th February, Colonel Charles Repington, revealed in the Morning Post details of the coming offensive on the Western Front. Lloyd George later recorded: "The conspirators decided to publish the war plans of the Allies for the coming German offensive. Repington's betrayal might and ought to have decided the war." Repington and his editor, Howell Arthur Gwynne, were fined £100 each, plus costs, for disobeying the Censor. Robertson wrote to Repington suggesting that he had been the one who had leaked him the information: "Like yourself, I did what I thought was best in the general interests of the country. I feel that your sacrifice has been great and that you have a difficult time in front of you. But the great thing is to keep on a straight course". General Frederick Maurice also sent a letter to Repington: "I have the greatest admiration for your courage and determination and am quite clear that you have been the victim of political persecution such as I did not think was possible in England." Robertson put up a fight in the war cabinet against the proposed executive war board, but when it was clear that Lloyd George was unwilling to back down, he resigned his post. General Douglas Haig rejected the idea that Robertson should become one of his commanders in France and he was given the eastern command instead. However, when the German offensive, launched on 21st March, destroyed the British Fifth Army, critics of Lloyd George's war leadership demanded that Robertson be returned to the War Office. On 9th April, 1918, Lloyd George, told the House of Commons that despite heavy casualties in 1917, the British Army in France was considerably stronger than it had been on January 1917. 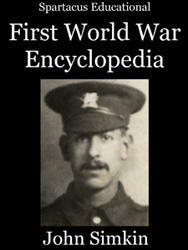 He also gave details of the number of British troops in Mesopotamia, Egypt and Palestine. Frederick Maurice, whose job it was to keep accurate statistics of British military strength, knew that Lloyd George had been guilty of misleading Parliament about the number of men in the British Army. Maurice believed that Lloyd George was deliberately holding back men from the Western Front in an attempt to undermine the position of Haig. On 6th May, 1918, Frederick Maurice wrote a letter to the press stating that ministerial statements were false. The letter appeared on the following morning in the The Morning Post, The Times, The Daily Chronicle and The Daily News. The letter accused David Lloyd George of giving the House of Commons inaccurate information. The letter created a sensation. Maurice was immediately suspended from duty and supporters of Herbert Henry Asquith called for a debate on the issue. Maurice's biographer, Trevor Wilson: "Despite containing some errors of detail, the charges contained in Maurice's letter were well founded. Haig had certainly been obliged against his wishes to take over from the French the area of front where his army suffered setback on 21 March. The numbers of infantrymen available to Haig were fewer, not greater, than a year before. And there were several more ‘white’ divisions stationed in Egypt and Palestine at the time of the German offensive than the government had claimed." The debate took place on 9th May and the motion put forward amounted to a vote of censure. If the government lost the vote, the prime minister would have been forced to resign. As A.J.P. Taylor has pointed out: "Lloyd George developed an unexpectedly good case. With miraculous sleight of hand, he showed that the figures of manpower which Maurice impugned, had been supplied from the war office by Maurice's department." Although many MPs suspected that Lloyd George had mislead Parliament, there was no desire to lose his dynamic leadership during this crucial stage of the war. The government won the vote with a clear majority and demand for Robertson's reinstatement came to and end. Following the armistice Robertson took command of the British Army of the Rhine. In October 1919, Robertson received a grant of £10,000 for the role he played during the First World War (Haig got £100,000, French and Allenby £50,000 each) and a baronetcy. 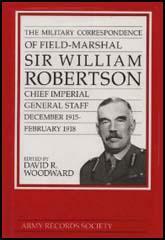 In 1920 Robertson was promoted to field marshall. He therefore became the first person in history to rise from lowest to the highest rank in the British Army. 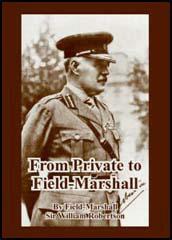 His autobiography, From Private to Field-Marshall, was published in 1921. Soldiers and Statesmen, 1914–1918 appeared in 1926. Robertson became a business executive, serving as chairman of the Brewers' Trustees and as a director on numerous boards, including British Dyestuffs, the Palestine Corporation, and the London General Omnibus Company. In 1932 he served as president of the Royal British Legion. Sir William Robertson died of a thrombosis on 12th February, 1933. At his death he had amassed a considerable estate with a probate value of £50,000. Sir William Robertson lunched with me. He was quite against the Eastern effort, as he has always been, and now he considered that it had become quite impossible owing to the difficulty of transport. He thought that the effect of dragging in the Balkans was only to prolong the war and weaken our forces in the West. The only two Eastern countries which could have given us effective help were Bulgaria and Turkey, and we had them against us. He was equally opposed to our tactics in Greece. He complained that there was far too much delay and no possibility of getting decisions out of the War Council. It was far too big and there was too much discussion. Something had to be done, in order to get a move on. He liked Mr. Asquith, but he was indecisive. Sir William said that the only man who could decide quickly, say "Yes" or "No" without hesitation, was Lloyd George. He might say the wrong "Yes" or the wrong "No" sometimes, but he much preferred that to no decision at all. He was in favour of some arrangement which gave Mr. Lloyd George greater power. He did not mean greater power to interfere with military operations, but greater power in the direction of war policy. (2) After the war, Sir William Robertson, Chief of the Imperial General Staff, attempted to explain the strategy at the Battle of the Somme. Remembering the dissatisfaction displayed by ministers at the end of 1915 because the operations had not come up to their expectations, the General Staff took the precaution to make quite clear beforehand the nature of the success which the Somme campaign might yield. The necessity of relieving pressure on the French Army at Verdun remains, and is more urgent than ever. This is, therefore, the first objective to be obtained by the combined British and French offensive. The second objective is to inflict as heavy losses as possible upon the German armies.